6.8 million women in England take part in sport regularly. How many of them are runners? I’ve worked out that just under 837,000 women are running in England – nearly 4% of all women aged 16 and over. If we apply the same percentage to the UK population figure for women aged 16 and over it means nearly one million women are running regularly. That’s an impressive figure. I’ve been using data from the Sport England Active People Survey (APS 7) and Office for National Statistics population data. I plan to find out what data there are for sports participation in Scotland, Wales and Northern Ireland too. 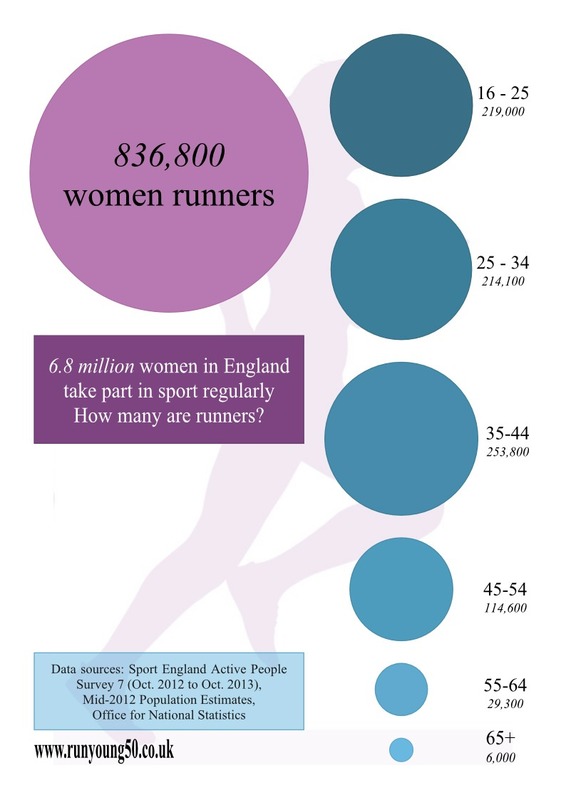 The infographic I’ve created shows how many women in England are running by age category. More women are running in the 35 to 44 age category than any other – nearly 7% of women this age run regularly. They are also the group showing the biggest increase in participation in running over 5 years – an increase of 2.3% – which is also a higher increase than any of the male age categories. Will these women carry on running leading to an increase in participation by the older age categories? The number of women runners aged 45 and over is much smaller: 149,900. And if you are a woman runner aged 65 or over you really are part of an elite group – only 6,000 women! In a future post I will look at the factors that might be behind the apparent drop-off in running after 45.